Mothers spend an average of 18 to 24 months raising a single litter to maturity. Cougars are mostly solitary animals, except when mating and when mothers are raising their young. Solitary does not mean that cougars do not have a social structure–quite the contrary. Cougars live in low-densities on the land–a single cougar requires 50 to 100 square miles to breed, raise young, and hunt. Both males and females are highly territorial and maintain and defend their chosen home ranges from other cougars. Females can be tolerant of slight overlaps in their territories with other females. However, males will defend their home ranges against transgressions by other males. Cougars advertise their availability for breeding through a system of feline communication which includes scent marking with scrapes (in tree bark or troughs in the dirt usually made with hind paws which are then often urinated or defecated on) and vocalizations. Female mountain lions are dedicated mothers and are either pregnant or raising dependent cubs for the majority (over 75%) of their lives. Mothers spend an average of 18 to 24 months raising a single litter to maturity. The mother only nurses her kittens for the first seven weeks of their lives and the rest of the time is devoted to teaching the kittens how to survive on their own. Female mountain lions are dedicated mothers and are either pregnant or raising dependent kittens for the majority (over 75%) of their lives. The average litter size is two to three kittens. 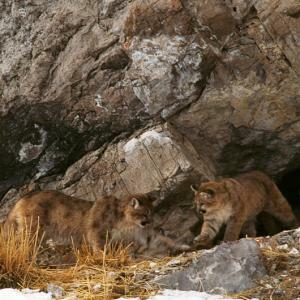 Research in New Mexico by Ken Logan and Linda Sweanor found a kitten survival rate of sixty to sixty-six percent in an area where cougars were not susceptible to hunting pressure by humans. As the kittens mature, the survival rate of females increases, while that of the males decreases. This is likely due to greater competition for home range territory with other males. The greatest cause of mortality in many cougar populations is human-related, through sport hunting, illegal poaching, lethal removal of cougars that prey on livestock or domestic animals, and auto-related deaths. Mortality in dependent kittens is often caused by the death of their mother for any of the above reasons; the orphans die of starvation or, without knowledge of proper behavior, become “problem cats” that are subsequently removed from the population. Intra-species competition is another significant source of mortality among cougars. Most male cougars in their prime show battle scars, indicating that cougars fight to defend their home-range territories, access to breeding females, and food. Males may kill a litter of kittens to induce estrus in a female and populate the territory with his offspring; females have been documented as dying in an attempt to defend her family.